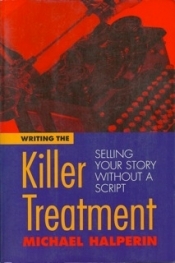 Writing The Killer Treatment: Selling Your Story Without A Script, by Michael Halperin, (Michael Wiese Productions, Studio City, CA, 2002, 171 pages). May 8, 2015 (San Diego's East County) - Who better to write a book about screenwriting and the movie and television industry, than Michael Halperin? He has been called “the foremost authority on screenwriting in America.” Halperin has written for television, screen, and stage, and has published both fiction and non-fiction books. Halperin’s Writing the Killer Treatment: Selling your Story without a Script, sets the standard for advice and instruction in modern storytelling for those aspiring to be screenwriters.